Home Instead Senior Care enables people to remain at home where they’re most happy and comfortable. 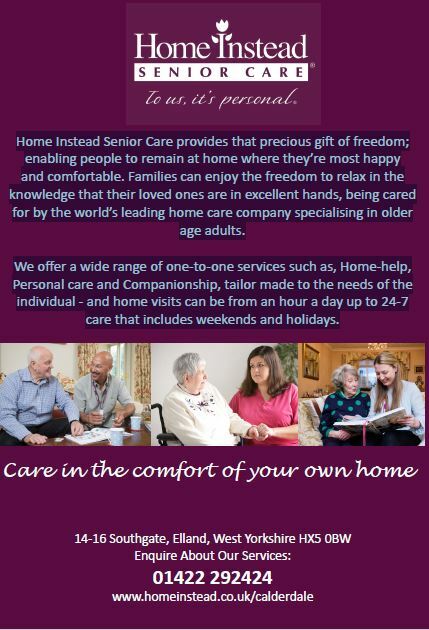 Families can enjoy the freedom to relax in the knowledge that their loved ones are in excellent hands, being cared for by the world’s leading home care company specialising in older age adults. They offer a wide range of one-to-one services such as, Home-help, Personal care and Companionship, tailor made to the needs of the individual – and home visits can be from an hour a day up to 24-7 care that includes weekends and holidays. For further information call 01422 292424. This entry was posted in Health, Staying Well and tagged Home Instead.